Caption slip reads: "Photographer: Snow. Date: 1954-08-10. Reporter: Bernstein. Assignment: Virginia Gaynor, Cocoanut Grove hat check girl. 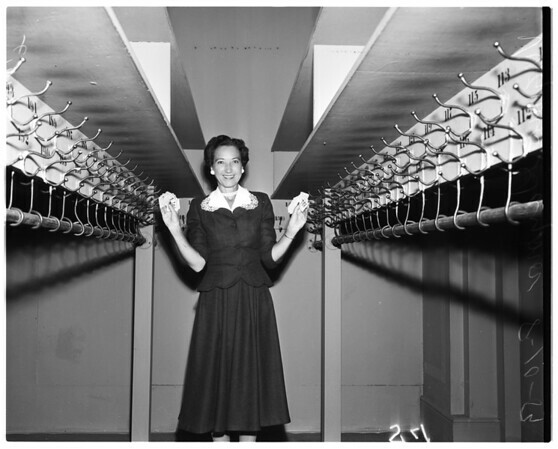 Virginia Gaynor stands between empty hat racks, holding checks. Miss Gaynor checks hat of patron about to enter Cocoanut Grove. (Patron's name is H.S. Herst who acted the part. He lives in Los Angeles)".